"Secrets of Scale Event #2 Technology The Matt Brown Show"
In the 19th century, Standard Oil controlled ±88% of refined oil flows and allowed John D. Rockefeller to become the richest man in history. The 20th century bore witness to the rise of the De Beers empire which, at its peak, owned 80% of the diamond market. In more recent times, certain companies continue to dominate their markets at will: AT&T, Amazon and Google immediately come to mind – oligopolies / monopolies of sorts. Yet, over the past decade the digital evolution has led to a significant paradigm shift in business models, with many asset-light technologies labelled “disruptive”. In particular, specific platforms enabling “shared economies” such as Airbnb and Uber have splintered strong-holds of legacy-driven industries, by simply connecting communities digitally. Many call this disruption, we call this evolutionary democratisation. Generalised dynamics of the rail industry are entrenched legacies, with historically politically protected strong-hold monopolistic positions that remain to this day. Unfortunately, this has led to lower service delivery, limited reliability, poor predictability and contrarian tariff setting, with many losing all faith in rail as a viable option for transport in Africa. But not for long; it was only a matter of time until the digital shared economy would see the white-space opportunity in rail to democratise it, offering optimisation, savings and fairness. This opportunity for rail was first identified by South African Ms Benji Coetzee, founder of multi award-winning technology platform, EmptyTrips. Benji and team have been aggressively pushing, and self-funding, the innovation over the past year since launching in April 2017. The technology uses directional capacity matching algorithms to better match freight to vehicles on routes; aggregating thousands of users inputs, better connecting counterparts and thereby reducing wasted space, costs and facilitate better sharing. After successfully launching RoadFOX (Road freight Open eXchange), the team, have taken on the fight to democratise rail freight in Africa by opening it up. 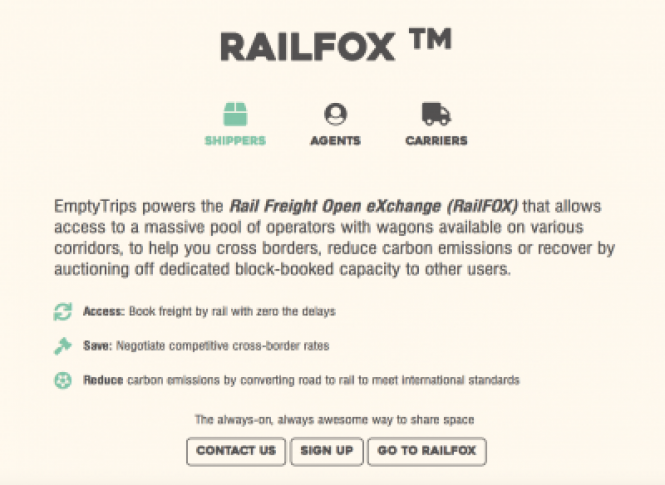 Benji, an evangelist for rail, and an ambassador for triple bottom-line impact, has powered the first Rail Freight Open Exchange (RailFOX) globally. In simple terms “It’s the expedia for rail freight”, says Mark Reed, Director Grindrod Rail Consulting Services. RailFOXTM (which can be accessed via www.emptytrips.com) has been marked as the most innovative enabler to regional integration, trade facilitation and corridor development acceleration. The platform, was launched at the recently held Africa Rail Conference and allows access to view trains running, generate quotes and even book wagons instantly (ideally at discounted rates) with reliable operators. RailFOXTM currently offers trains from South Africa’s main ports up to Ndola, in partnership with Grindrod Rail Consulting Services. The team aim to expand their corridor network and operator relationships across Africa, to create a truly integrated African Rail Open Exchange. EmptyTrips are currently exploring anchor partnerships for “along route” on-demand warehousing and consolidation points to launch StoreFOX, i.e. pay as you need storage which will further increase volumes to be moved by rail. The power of the platform is its’ network effect of aggregating both cargo and capacity. By enabling round trips and freight volumes to be consolidated. The average cost per tonne is reduced, utilisation and yields are improved for carriers, an all-round winning solution. Better utilisation of rail networks not only improves bankability for infrastructure projects and fleet replenishment needs, but higher freight volume by rail, reduces long-haul trucks and is simply just better for the environment. Not only does the portal have the smart inter-modal matching of capacity to freight capability, but allows for secure, anonymous auctions to protect industry players and avoid a “race-to-the-bottom”. The portal allows operators and traders to auction capacity and freight for trains / take-or-pay contracts to the market, and vice-versa, freight owners can auction off cargo setting floor or ceiling prices per tonne. Given the virtual transacting of parties, the exchange introduces dynamic demand-based pricing to the market, a much needed independent mechanism.